The highest compliment I can give a book is that I didn’t want it to end. 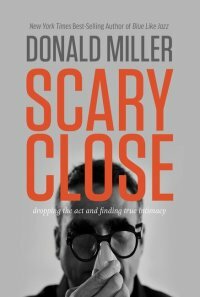 That’s the case with Donald Miller’s newest, Scary Close: Dropping the Act and Finding True Intimacy. This is Miller’s strongest book in years, and the chapters live up to the subtitle–Miller is extremely candid about the rough time he’s had as he’s wrestled to get free of the manipulation, attention addiction, and using people that had colored most of his adult life. That doesn’t sound like an inspiring book, and it isn’t, at least not in a rah-rah, you can do it! kind of way. Instead, Scary Close made me think: about the arc of my relationships, those that have succeeded and those that failed, in ways I’d never considered. He raises questions I hadn’t heard before. It was incredibly helpful, without being prescriptive. That’s rare these days in Christian non-fiction, and such a treat when you find it. The other great thing about this book is that Miller is still so very much in process with all of this. He doesn’t have it all perfected yet, and he does some of the very things he says he’s trying not to do, just pages after he tells us about his commitment not to do them (such brag about all the famous people he knows–there’s a lot of name dropping here–or how successful his company is). But that’s part of the beauty of this book, I think, seeing how growth happens in a real life. And he’s smart enough to paint his new wife as an absolute angel. I’m sure she’s a regular person like the rest of us, but it was refreshing to see him hold her in such high regard. This was a great read. I look forward to the next installment. This entry was posted in Book Recommendations, Books and tagged Donald Miller, Scary Close on February 6, 2015 by Trish Ryan.